Trusting your gut when it comes to being able to tell if someone’s lying is something we’ve all heard before, but trusting your nose? That’s something new. Lie detection is usually done with a polygraph, but when you learn to look for certain signs that you’re being lied to, you can become a human polygraph. Lie detection can be done by those who are experts at facial expression. They say that a lie is as plain as the nose on your face. If you already read our article, 10 Signs You’re Being Lied To, then you know that lie-spotting is a strategy of lie detection based on non-verbal facial expressions and body language cues. We are familiar with the story of Pinocchio and how his nose would grow every time he told a lie. Having a way to easily detect deception could either help or hurt our social relationships with others. If we knew that someone had lied to us, how do we resolve our trust with that person in the future? Some researchers asked themselves, what if Pinocchio believed that his lie would never be detected? If we knew we would not be accused on lying, would we still be able to see the signs of lying? In a study of a mock crime, scientists looked at the difference between the brain scans of those who believed that a lie detector could detect their lie and brain scans of those who believed they would get away with the lie. When participants lied and worried about being caught, their brain activity gave them away. Researchers say ‘Producing deception is emotionally taxing, and causes anxiety and physiological arousal that require effortful self-regulation.’ In other words, having to remember the details of the lie created stress for the liars and that stress showed up as increased brain activity in certain areas of the scan. Lie researchers say the emotional conflict resulting from making a false claim while risking a potential confrontation is what causes brain stress, and elevates cortisol levels for the person who is lying. When people lie, they have to prepare a response for the person who is doing the interrogation. They have to remember important details of their story and if they forget, they will be caught in a lie. Lies are one of the warning signs of sociopathic behavior, as you read in our article 7 Warning Signs You’re in a Relationship With a Sociopath. Once you know that there is a pattern of lying, you may face a decision about whether to trust someone close to you again. These researchers also say ‘Stress causes individuals to feel hot, which forces them to fan themselves to cool down.’ The stress of lying causes skin to flush with blood, which is an attempt for the body to lower its temperature. The blood flow can sometimes cause the skin to appear reddish, especially in the nose. The liar feels the hot flush of blood rushing to the skin and they may attempt to cool themselves by fanning themselves with hands or paper. Another study focuses specifically on nose temperature and found that the nasal temperature rose when study participants were asked to lie about cheating on a test. The higher nose temperature was detectable during the planning of the lie die to the increased mental activity and also during the telling of the lie. Researchers suggest that the future of lie detection may involve thermogram imaging of faces to detect deception. 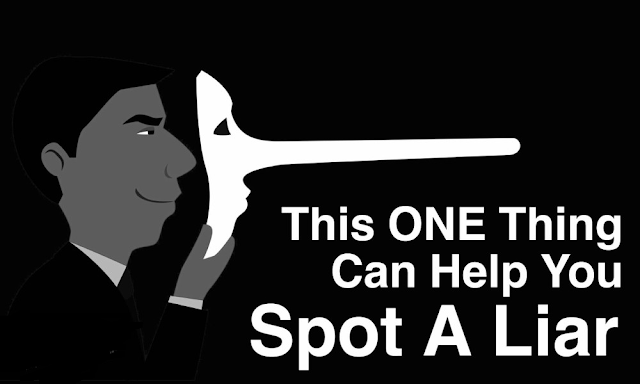 Does knowing about lie detection methods make you less likely to lie, or make you a better liar? A good liar could use all of this information to avoid the non-verbal signs of lying and maintain a calm, cool exterior. But their nose might still be what shows them to be lying, just like Pinocchio.